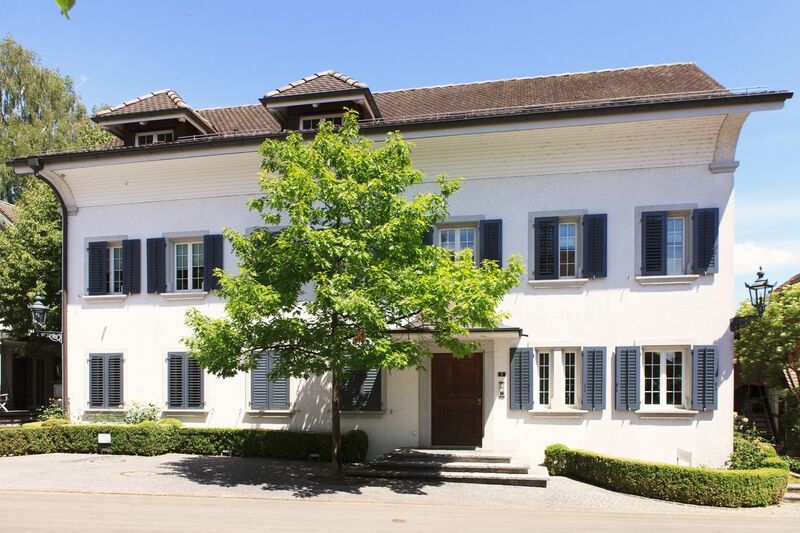 The property «Götzen» is idyllically situated in the middle of the municipality of Rafz. This offering is located on the top two floors of the building and comprises approximately 176m². 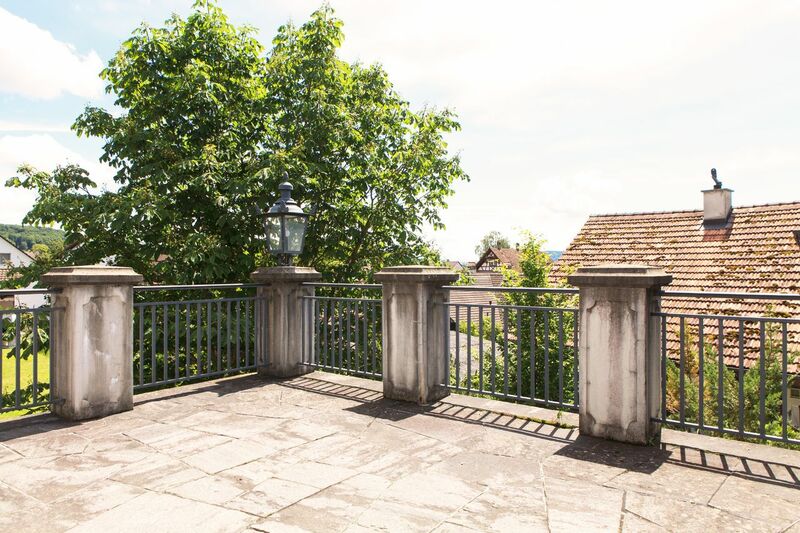 It has a large terrace with beautiful granite slabs, a brass handrail (pulverized), a historic "Zurich lantern" and French sandstone balustrades. Currently, the object is being used as a company headquarters but can be converted into a roof maisonette apartment fairly easily. 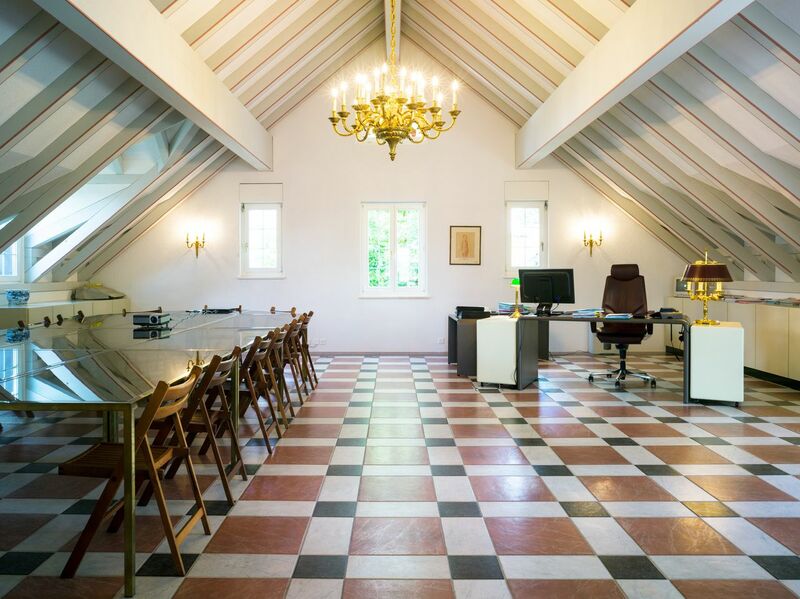 The two variants can be ideally combined to suit living and working under one roof and would work perfectly as an office or as a doctor's practice. After entering the Anteroom you will find a spacious area, usable as a cloakroom and a guest toilet with wonderful marble cladding from Carrara. 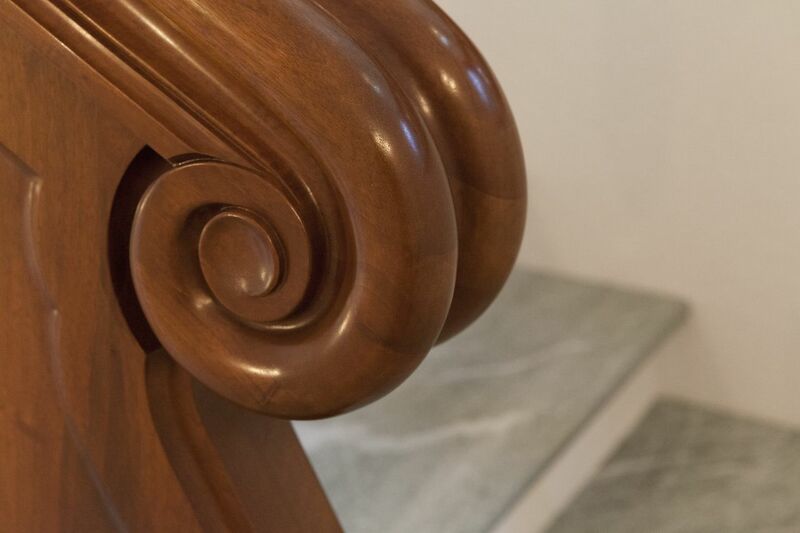 The characteristic lime green staircase of "Verde-Spluga" is rounded off with Florentine edges has a carved walnut and has been treated with shellac. 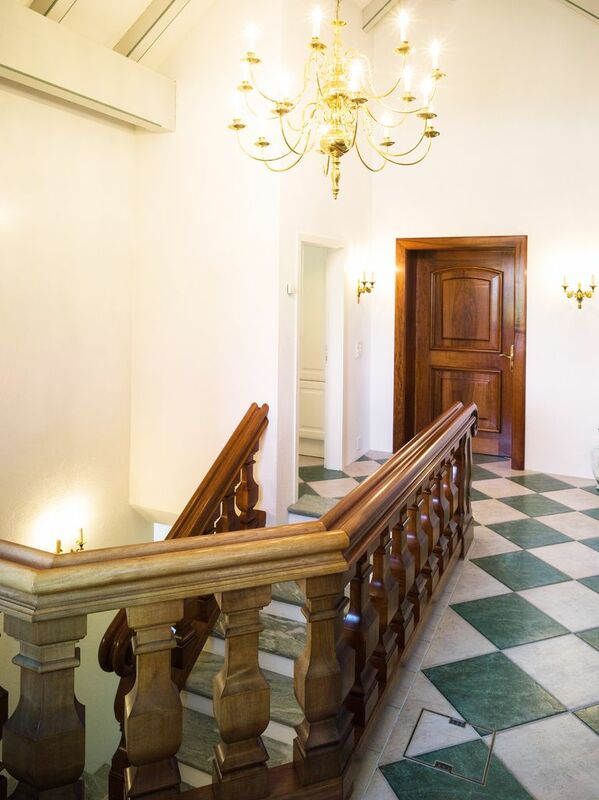 This beautiful staircase leads you to the upper floor where a ceiling height of over 4 meters and a stylish floor in the style of a Venetian palazzo impresses to say the least. The color of the floor is subtly absorbed into the beams and provides perfect harmony for the space. The color concept continues in the living room, which is a tasteful salmon color. 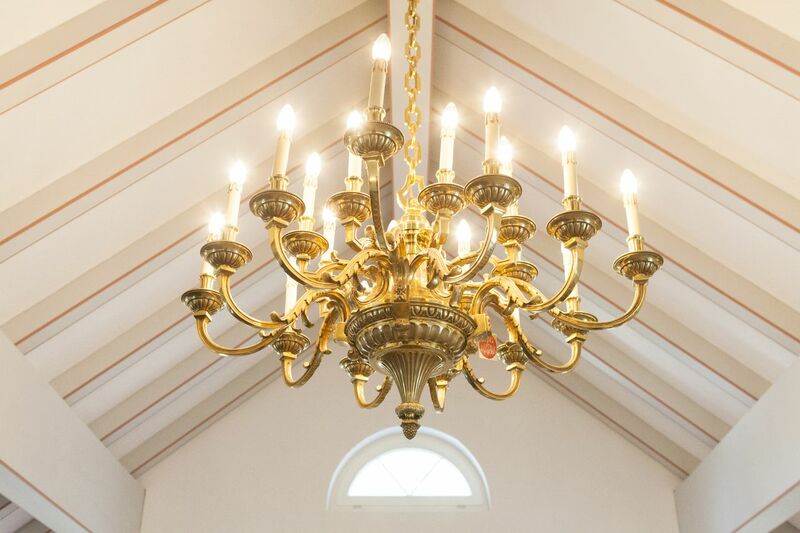 In the middle of the living room is a chandelier, which was specially made by the french creator "Lucien Gau" and is from Paris. 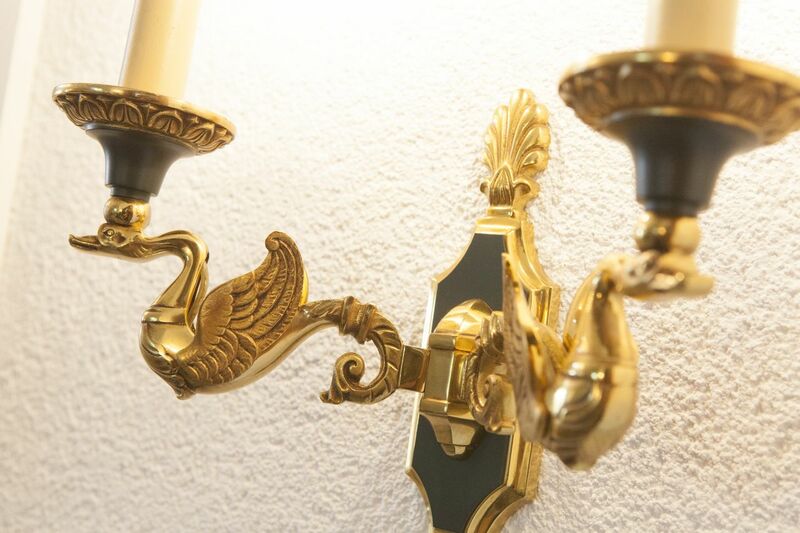 All of the wall lights were exclusively matched so that a coherent lighting concept was created. 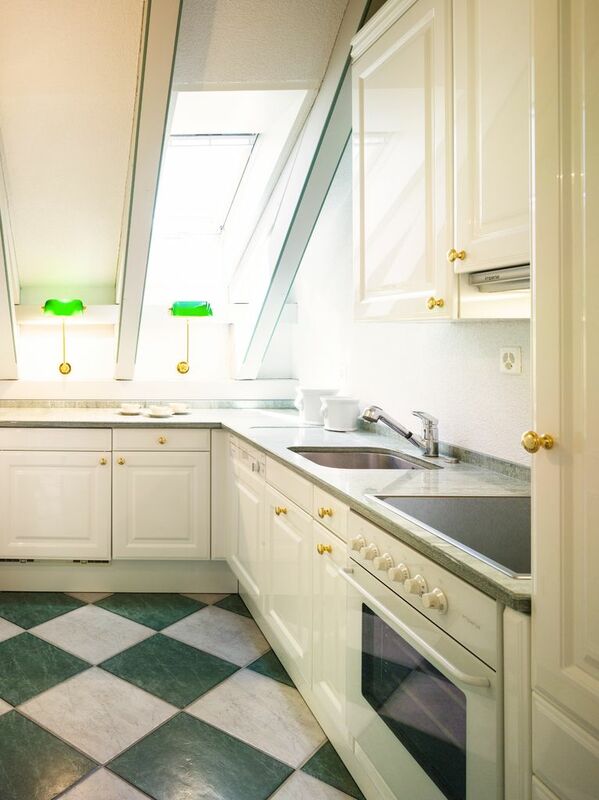 The modern kitchen in a chic country house style has granite tops from "Verde-Spluga". The second toilet in the attic is also lovingly decorated with Carrara marble. The attic has four underfloor heating plates, which can be individually controlled. There are floor ducts for the wiring, so that the lightness of the room feeling is not impaired. 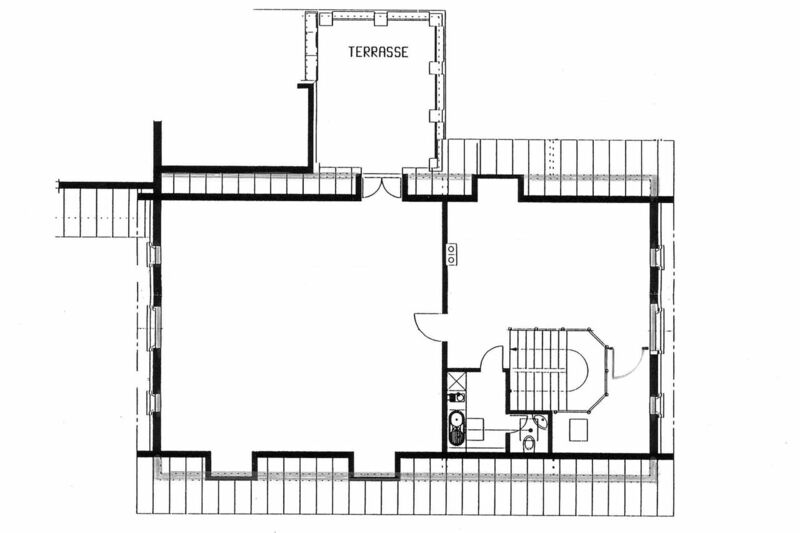 A dry room and a bicycle room (communal) as well as four outdoor parking spaces complete this offering. The stately home with great attention to detail blends in ideally with the charming village center. 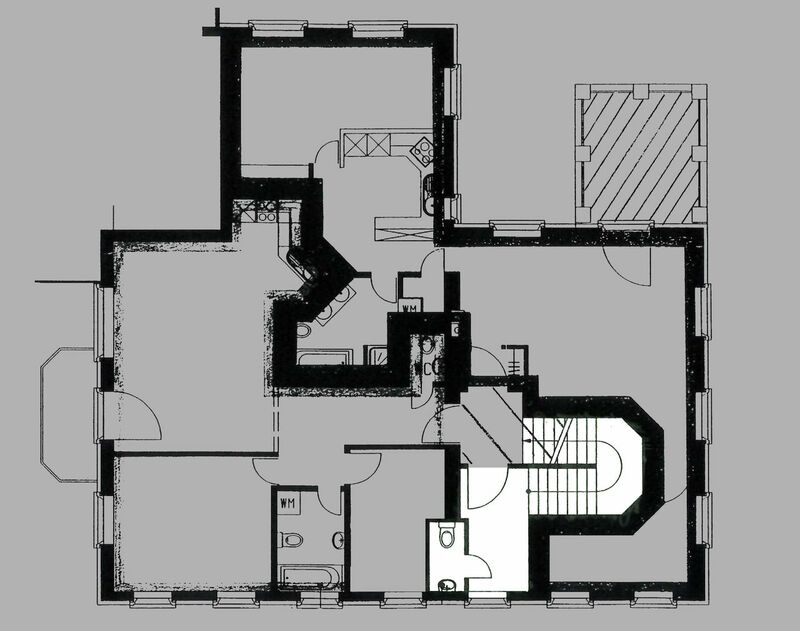 During the planning, much attention was paid to every little detail, which makes the property a real showpiece. For example, the windows have sprouts and traditional shutters in blue-green, which give a nice contrast to the bright white facade. The dark blue, electric awnings and the carefully selected plain tile round off the harmonious exterior. The outer surfaces were also lovingly designed, with a variety of bushes, trees and flowers. The fountain, made from Rorschacher sandstone, receives its water from the property's own underground water source. Here, too, you will find the very tasteful historic «Zurich lanterns». 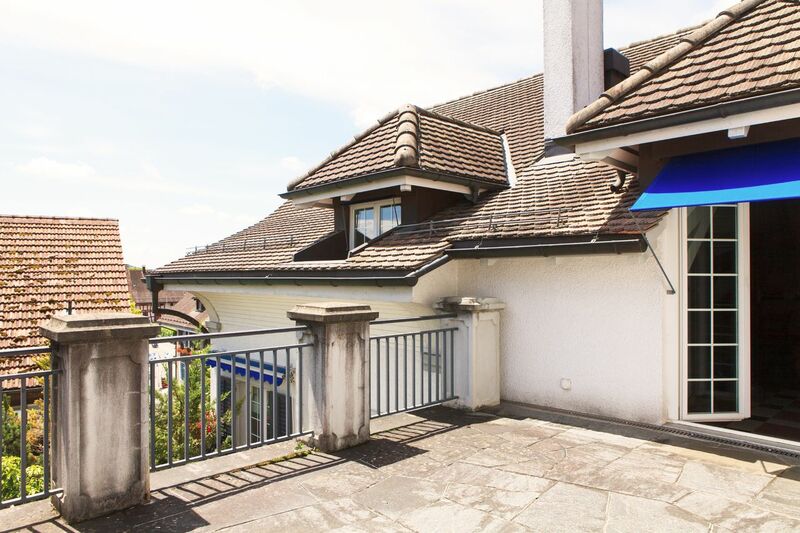 The village Rafz is located only a few kilometers north of Zurich, in the so-called Zurich Unterland. The region has a very nice mixture of living, working and leisure activities. One of the most beautiful sections of the Rhine lies in the Zurich Unterland. The lovely riverside is extremely inviting and is the optimal place for barbecues or a simple stroll. Fully-developed hiking trails along the shore provide wonderful opportunities for biking or hiking. Rafz is a beautiful place with a charming ambience with many stately timbered barns and vineyards. The north of Rafz is bordered by two distinctive hills (the Gnal and the Schürlibuck) and in the south the "Rafzerfeld," a large level surface used as the granary of the canton of Zurich. Due to its fully developed infrastructure, Rafz is a very popular place to live and work. Furthermore, the Golf Club Rheinblick is only 4km away. All of these advantages have resulted in more and more people choosing Rafz as their primary residence. Rafz is the largest municipality in the Rafzerfeld has about 10 km of borderline with Germany. The optimal traffic connections to Bülach, Zurich Airport, Winterthur, Zurich and Schaffhausen have increased the population in the last 20 years by almost 50 percent. Today Rafz has just over 4'400 inhabitants. Through this development, the image of the community was shaped sustainable. Nevertheless, Rafz has remained a unified community of politics, schools an activities and in every respect is a lovable and endearing village. Retailers offering all the necessities of daily life, various catering establishments, an active trade in a wide variety of goods and services and a well-functioning infrastructure guarantee an all round well-being. The wonderfully landscape of the Zürcher-Unterland region, which stretches across the Rhine all the way to the Black Forest, has around 40 clubs and organizations that offer the opportunities to engage in sporting and cultural activities. The Airport Highway (A51) and the Highway (A50) are within a 10-minute drive. 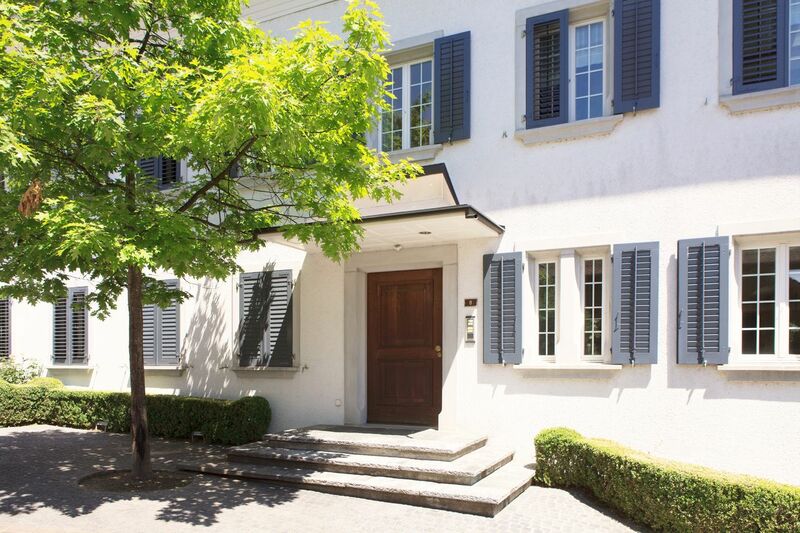 Zurich Airport is 20 minutes away and the city of Zurich a 30-minute drive away. The train station of Rafz is only a 15 minute walk or 4 minute bus ride away, from there the S9 runs every half hour towards Uster (Bülach-Oerlikon-Hardbrücke-Zurich HB-Stadelhofen-Uster) and in the opposite direction every hour to Schaffhausen (Neuhausen-Schaffhausen).